If corporations are serious about climate change, they must take a hard look at groups that represent them while opposing all legislation. We are from opposite coasts, serve on opposite sides of the Capitol and one of us is in the majority party while the other is in the minority, but we share one thing as members of Congress: The political experience of having a relentless adversary, the U.S. Chamber of Commerce, to any and all meaningful legislative solutions on climate change. We also share the experience of working with our local chambers of commerce, which represent the business community in our home states in positive, honorable ways, including on climate change. In California, for instance, local chambers around the state celebrate our green economy and give awards to recognize green businesses. In Rhode Island, local chamber members celebrated the country’s first offshore wind energy project. That's why we share considerable surprise at the U.S. Chamber’s relentless opposition to any serious climate legislation. The national Chamber has a very different agenda from the local chambers from whom we are used to hearing. It subordinates its members' other interests to the fossil fuel industry’s decades-long campaign to block any meaningful action in Congress on climate change. In the 2016 election, for example, the Chamber ran one attack ad after another against congressional candidates who supported policies to reduce carbon pollution. In 2017, the Chamber funded a wildly misleading economic study that President Trump cited as justification for withdrawing from the Paris Climate Agreement. That year the Chamber also issued a “Key Vote Alert” — its signal to members of Congress of how to stay on the Chamber’s good side — for a measure that would let oil and gas facilities release huge quantities of methane, a potent greenhouse gas. And just last year, the Chamber filed an amicus brief in support of major oil companies seeking to dodge liability for the damage their carbon pollution is causing. Meanwhile, the Chamber’s board includes plenty of companies that publicly take a very different position. In 2016, eight Senators looked at what companies represented on the Chamber’s Board of Directors said and did about climate change and found that about half of the Chamber’s board had adopted pro-climate action positions, contrasting sharply with the Chamber’s activities. Not a single board member would say they supported the Chamber’s obstructive stance on climate. So what explains the Chamber’s relentless lobbying and electioneering activities to obstruct any serious climate legislation? Due to the lack of transparency in the U.S. Chamber’s funding, we do not know. As public recognition of the climate crisis grows, so does pressure on corporate America to support climate action. 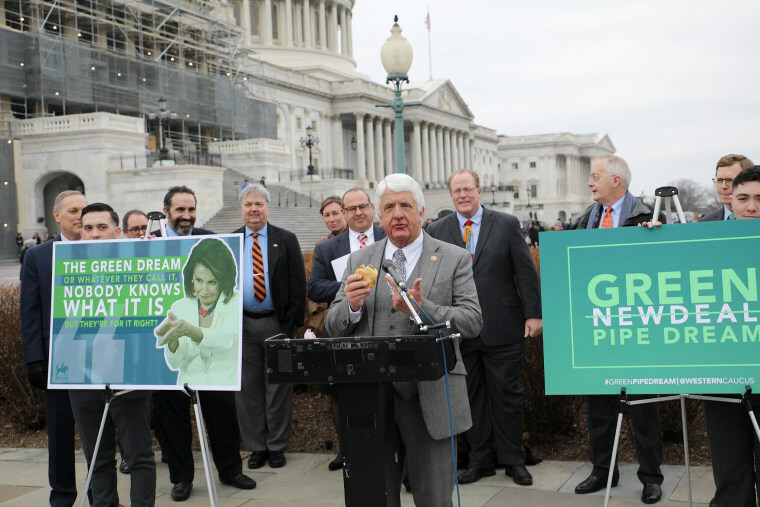 There are many bills and ideas in Congress that could help address the crisis, separately or together — including the Green New Deal, which has provoked a virtually hysterical reaction from our Republican colleagues. There are also carbon-pricing proposals, some of which have been described by Republicans as offering not just an olive branch but an “olive limb,” and have been reviewed favorably even in the Wall Street Journal. And there are numerous other proposals in the middle which could be pulled into a meaningful bill to help us solve this looming problem, before it gets even more out of hand. If corporate America is serious about addressing climate change, it needs to take a hard look at lobbying groups like the Chamber that claim to represent corporate America while opposing all these legislative proposals. In particular, it is important for these corporate lobbying groups to be transparent to their members and to the public about who is actually funding them: the most logical explanation for why the Chamber’s climate stance fails to match its members’ is because the fossil fuel industry is pulling strings behind the scenes via anonymous funding. As an opener, the Chamber should at least support a bipartisan acknowledgement offered in the Senate that says: climate change is real; human activity during the last century is the dominant cause of the climate crisis; and the U.S. and Congress should take immediate action to address the challenge of climate change. The editorial board of USA Today recently wrote: “Republicans... can have a grand old time mocking the Green New Deal... [but they] owe this and future generations more than scorn; they have an obligation to put better ideas and solutions on the table.” The same advice should apply to the U.S. Chamber of Commerce and related business groups that are also inexplicably hostile to climate action, like the U.S. Farm Bureau and the National Association of Manufacturers. Denial is no longer an option; mockery of the Green New Deal is not a constructive answer. It is time for serious action. We need to see a constructive proposal that keeps us from exceeding a 1.5 degrees Celsius global temperature increase. These big business lobbying groups either need to align their efforts with the business community they supposedly represent and become part of the solution, or they need to come clean about who is really funding and driving their climate agenda — and own that it's hardly a majority of their members. Sheldon Whitehouse is a U.S. Senator serving Rhode Island. Jared Huffman is a U.S. Representative serving California’s 2nd District.